In recent years, New Century Language and Culture Center has strengthened cooperated with a few universities in the USA, such as Wheaton College, Union University and the University of Connecticut. 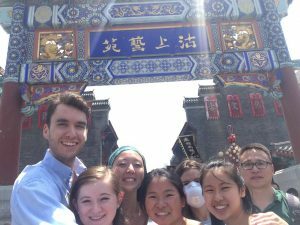 We provide training courses and Chinese cultural experience activities for their Chinese language intensive project over their summer break. The study at New Century brings with it the flexibility to custom design a learning experience. We work around the availability of our students to create a schedule and a study plan that meets the specific requirements of different universities and the needs of the students. Our intensive project is no longer boring, and we have received good teaching results after developing our students’ interests. In addition to taking classes, options include language activities that related to a student’s area of interest. Our school also arranges a variety of cultural experience activities for students, such as tea art, Chinese calligraphy, Chinese opera, Chinese martial arts, history lectures; visit Tianjin, Beijing and surrounding historical sites; Taste Tianjin special snacks; we also provide home-stay accommodation so that students can experience the daily life of the Chinese families, and make friends. We want our students to have a wonderful and memorable time in New Century, Tianjin. New Century is willing to spread China’s extensive language and profound Chinese culture to those who are interested in China and Chinese language. Over the past years, we have won the unanimous recognition and praise from our partner universities for our teachers’ rich teaching experience and tailored teaching method.